We’d love your help. Let us know what’s wrong with this preview of I Am Not a Number by Jenny Kay Dupuis. To ask other readers questions about I Am Not a Number, please sign up. Is this a graphic novel? Kate No, this is a picture book. 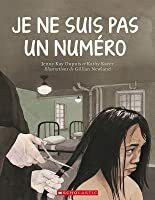 I am Not a Number is yet another contribution to the Canadian Truth and Reconciliation work, a picture book based on the experience of Irene Couchie Dupuis, grandmother to the author, Jenny Kay Dupuis. The Dupuis family is part of the Nipissing First Nation. Jenny’s Grandmother was forcibly taken from her family and placed in a de-Indianizing Residential School. These schools operated for over 100 years in Canada and the U.S. The last Canadian residential school closed, not in 1896, but in 1996! 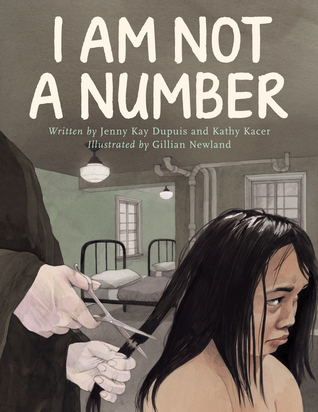 I am Not a Number is yet another contribution to the Canadian Truth and Reconciliation work, a picture book based on the experience of Irene Couchie Dupuis, grandmother to the author, Jenny Kay Dupuis. The Dupuis family is part of the Nipissing First Nation. Jenny’s Grandmother was forcibly taken from her family and placed in a de-Indianizing Residential School. These schools operated for over 100 years in Canada and the U.S. The last Canadian residential school closed, not in 1896, but in 1996! At the school, Irene was told by the nuns there that she would no longer have a name, but a number—hers was 759—recalling the tattooed numbers of the Holocaust, of course. Children were denied access to their parents, they had their long hair--a source of cultural pride--cut short, they were denied access to their native language, and so much more. When she and her siblings came home for the summer, their parents devised a plan to hide them, but these eventually protected children were in a minority. This was a long accepted practice of cultural genocide, one practiced in various ways around the world for those in power who want to eliminate minority cultures. "I dreamed of being back on the reserve, where I could play with my brothers, sisters, and cousins. I wanted to hear the song of the meadowlarks in the grassland. I yearned to spread my arms wide, as if I were ready to soar, like them. I longed to fly away, but for me there was no escape." "How could I possibly forget my parents? How could I possibly forget who I was?" "Back home, long hair was a source of pride. We cut it when we lost a loved one. Now it felt as if a part of me was dying with every strand that fell." I was totally oblivious to the part of history that involved the Canadian Indian residential school system. Apparently during the 19th/20th century Indigenous kids from Canada were sent to these bording schools with the intent of being educated as to be equals to thei "How could I possibly forget my parents? How could I possibly forget who I was?" I was totally oblivious to the part of history that involved the Canadian Indian residential school system. Apparently during the 19th/20th century Indigenous kids from Canada were sent to these bording schools with the intent of being educated as to be equals to their European peers so that racial segregations wouldn't have been a problem anymore. All of this translated though into a cultural genocide of the Indians because they were taught that they were uncivilized and were forced to abandon their mother tongue in favour of the English one. The book is a real-life story about the author's grandmother who was sent to one of these bording schools when she was merely 8 years old. There she endured punishments and harsh life conditions at the hands of the nuns who ran the school. These kids grew up not knowing where they belonged anymore, ashamed of themselves, not being able to socialize or build families of their own because were denied one during their childhood. And the worst part is that when these schools were officially closed I was already born! This is not ancient history. Really, we do love reading our dystopias but the worst ones are the ones that happen in real life. Plus, the illustrations are beautiful. I kindly received this book from its publisher via Netgalley. I Am Not A Number tells the story of Jenny Kay Dupuis' grandmother Irene. Set in the 1920s, Irene is taken away from her family, and forced to endure horrible conditions and abuse in the Canadian residential school system. Stunningly told, and with stunning illustrations, I Am Not A Number is absolutely worth reading, especially as an introductory book for information on a difficult subject. Although it is a picture book, it definitely isn't intended for small children, and might be more appropri I Am Not A Number tells the story of Jenny Kay Dupuis' grandmother Irene. Set in the 1920s, Irene is taken away from her family, and forced to endure horrible conditions and abuse in the Canadian residential school system. This book matters to me. I have friends who survived their own residential school school experiences. They are also survivors of dysfunctional families created because their elders and previous generations were dragged from their families and forced to attend one of these institutions. The last residential school in Canada didn't close until 1996. I Am Not A Number is the true story of Irene Couchie Dupuis, grandmother to the author, Jenny Kay Dupuis. When Irene was eight years old, an Indian ag This book matters to me. The last residential school in Canada didn't close until 1996. I Am Not A Number is the true story of Irene Couchie Dupuis, grandmother to the author, Jenny Kay Dupuis. When Irene was eight years old, an Indian agent came and took her and two brothers away from their home and community of Nipissing First Nation, to go to the Spanish Indian Residential School. The children's names were taken away and replaced with a number. Irene's number was 759. Her story reveals the cruelty and neglect these children endured at the hands of the nuns in charge. When Irene and her two brothers returned home for the summer, they told their parents about their experiences. The family came up with a plan to hide and protect the children so they wouldn't have to return. Many, if not most other children were not so fortunate. Not only were they unable to escape, their experiences were much more horrific than what is revealed here. This is not a comfortable read, but it is an important, necessary narrative for building knowledge about this despicable aspect of our history. At least one copy should be in every school and public library to use with elementary and older students. Adults should read it too. This is a very short children's book about Canadian's treatment of Native Americans (if you think of American as the continent). It's meant for an age bracket younger than those who would read Island of the Blue Dolphins. An important book for any young reader to become aware of how the world does not get along racially. The illustrations that accompany the story are marvelous. Heartily recommended. My free reader's copy had an extensive afterword written for adults that I found very interesting. This is a very short children's book about Canadian's treatment of Native Americans (if you think of American as the continent). My free reader's copy had an extensive afterword written for adults that I found very interesting. It covers more in depth the history upon which the story is based. Based on the author's grandmother's harsh experiences at a residential school in Canada. Don't miss the additional author's note in the back. I received an arc from Netgalley. This is an excellent way to introduce young children to the history of the residential schools. It is a moving story of one young girl who is sent away from home, and her father's fierce love of his children. It would be an excellent addition to any school or home library. This is a must read in classrooms and homes across Canada. Very well written and illustrated telling of the horrible truth of residential schools. Kids need to know so we have a better world for them and their kids. Shows the deep love of family, culture and home. At the age of 8, Irene and her two brothers are taken away from their parents and sent to a residential school, not because of neglect or poverty but in a misguided effort to "civilize" the indigenous people by teaching them the "proper way" to live. Separated from even her siblings, Irene loses everything: family, her hair, and even a name. Known instead as student 759, she has to endure the harsh discipline and isolation throughout the school year. This is well designed to engage elementary chi At the age of 8, Irene and her two brothers are taken away from their parents and sent to a residential school, not because of neglect or poverty but in a misguided effort to "civilize" the indigenous people by teaching them the "proper way" to live. This is well designed to engage elementary children, from the story with evocative illustrations to the author's explanation that this was her grandmother and the factual ending. Although short, the ramifications of this story are far-reaching, and I think it will provoke good discussions. A section at the end, after Irene's experience, explains the bigger picture: that around 150,000 children were removed from their families and sent to these residential schools, that many lost their cultural identity and ability to feel a part of any society, and that these schools continued until the mid-1990s. Although I had been aware of the schools, the dates surprised me, as did the dates of desegregation. It's good to remind parents, too, of how recently these acts of "civilization" occurred. This book tore at my heart. The residential schools were a black mark on Canadian History as well as the Christian Church. To tear children away from their families and force them to live a life that is completely unfamiliar to them is awful enough, but to tell them their language, life, beliefs etc. were evil is devastating. I cried as I read this story about young Irene Couchie and her brothers. The way she was treated was despicable. It is no wonder so many Native Canadians had/have mental he This book tore at my heart. The residential schools were a black mark on Canadian History as well as the Christian Church. To tear children away from their families and force them to live a life that is completely unfamiliar to them is awful enough, but to tell them their language, life, beliefs etc. were evil is devastating. I cried as I read this story about young Irene Couchie and her brothers. The way she was treated was despicable. It is no wonder so many Native Canadians had/have mental health issues. The threats to her parents of arresting them if they did not turn over their children was extortion at best. Kudos to Irene for sharing this story with her granddaughter to publish. The way it is written is wonderful for children to learn about this shameful time in Canadian History without them dealing with trauma. It is sad, but I know there is so much more that could have been added that would have been too much for children to hear. A definite must for all Canadian History classes in elementary schools. This is an amazing book. It is written simply and too the point, based on the life of the author's grandmother. In the United State, Australia, and Canada, and perhaps other places as well, the Indigenous people were removed from their homes and families and forced to become "white". They were forbidden to speak their native tongue, forbidden to eat their food, and forbidden to have any contact with their families. The author's grandmother was one such child in 1928, in Canada. She and her bothers This is an amazing book. It is written simply and too the point, based on the life of the author's grandmother. The author's grandmother was one such child in 1928, in Canada. She and her bothers were removed from their family and forced to speak English, and beaten when they did not. This did not just happen to a few children, and this did not just happen back in the olden days. The last of the residential schools closed in 1996! Perfect book for teachers to discuss history. Perfect book for young children to read to understand what happened. Heartbreaking and unfortunately very, very accurate. This was the book I read to my daughter the day after the election. I decided it was important for her to start learning the history of how Native Nations have been treated over the years. It isn’t necessarily a new conversation with her, but I think this was one of the most real. Her newest thing is to ask, is this a true story? And this one is. I can’t say the book is a beautiful story, but it is a beautiful book. It tackles a dark and difficult topic. Irene and two of her brothers are sent off This was the book I read to my daughter the day after the election. I decided it was important for her to start learning the history of how Native Nations have been treated over the years. It isn’t necessarily a new conversation with her, but I think this was one of the most real. Her newest thing is to ask, is this a true story? And this one is. I can’t say the book is a beautiful story, but it is a beautiful book. It tackles a dark and difficult topic. Irene and two of her brothers are sent off by the local official to the residential school. They last one year and upon returning home for the summer spill the atrocities that they have encountered. Their father comes up with a plan, stands up to the government official, and manages to prevent them from having to go back. Many were not so lucky. A personal and informative author’s note at the end adds a little more detail to the story. The illustrations fit this beautifully. The sombre color palette and the simple, clean settings perfectly reflect both the mood and place of the book. The nuns are creepily white as I’m sure they probably seemed in their dour habits. This is a long picture book. Many pages are full of text with a picture on the facing page. I do think it’s intended for a slightly older audience and I think you could use it as a read aloud well up into middle school. But I will say my five year old sat through it with no complaints. The story was captivatingly told. I can’t stress the importance of having these books in your library collection enough. They reflect accurately the experiences of many Native families and the history of many Native peoples (not just the ones in Canada). They can start conversations, albeit hard ones for us white teachers and parents, around the deep seated racism in our country and how that has played out over the years. They can also ensure that children are being exposed to this history. It is unlikely that most schools are teaching about this in any classroom, even in high schools. If you work in a middle or high school library I recommend putting this on your shelf, but if you can’t or won’t put a picture book out, get Fatty Legs and promote that. I had a private school education and as an adult I find myself asking what the hell my parents paid for. I learned nothing. Nothing. Ignoring the difficult parts of history and literature, I still learned nothing. Make sure that doesn’t happen to your students. The way Native Americans have been treated in the past is something that needs to be taught to children now. It’s not easy to read about. It is, however the facts. I am not a Number offers a valuable lesson in history in a simple and profound way. In I Am Not A Number, Irene’s parents, like many Native parents, were coerced into giving up their children. In Canada, in 1928, Dupuis's grandmother, Irene Couchie Dupuis, was taken to a residential school in Canada. These were schools designed to "civ The way Native Americans have been treated in the past is something that needs to be taught to children now. It’s not easy to read about. It is, however the facts. I am not a Number offers a valuable lesson in history in a simple and profound way. In I Am Not A Number, Irene’s parents, like many Native parents, were coerced into giving up their children. In Canada, in 1928, Dupuis's grandmother, Irene Couchie Dupuis, was taken to a residential school in Canada. These were schools designed to "civilize" and convert Native children. Her hair, along with the other girls, is cut short. They’re also punished for using their own language. When Irene and her friend speak in, Ojibwe, one of the nuns hits her with a wooden spoon, saying it’s ”the devil's language." The nun then punishes Irene by filling up a bedpan with hot coals to burn Irene's hands and arms. This is indeed how the children at the schools were punished. Irene's story ends on a hopeful note. She and her brothers go home for the summer. When the agent shows up in the fall, the children hide in their dad's workshop. Irene's dad challenges the agent and says, "Call the police. Have me arrested,” vowing that his children will never be taken away again. In the Afterword, Dupuis writes that her grandmother was only at the school for that one year because her fathers resistance worked. She was able to stay home, with her family. The lesson is, resistance works against injustice. In the back of the book Dupuis and Kacer provide historical facts and information about the residential school system, specifically the Truth and Reconciliation Commission (the TRC) released in 2015. The history of the US and Canada is complex and often painful. However, I am Not a Number provides a valuable history lesson with straight forward text and enhanced by beautiful illustrations. I highly recommend this read aloud book for children 6 years and older. Based on the true story of the author’s grandmother, this picture book captures the experience of First Nations people in Canada being sent to boarding schools. Under threat of fines and jail time, First Nation parents were forced to give their children up to the government. When Irene is taken to her new home, she tries to never forget her real home, her parents and their way of life. Irene is called only by a number at the school and told to scrub the brown off of her skin. 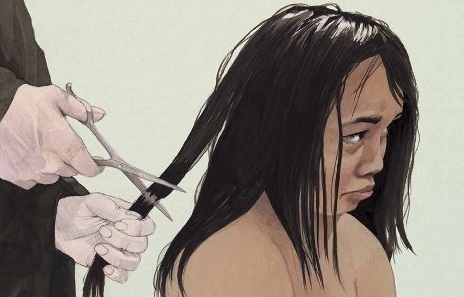 Her hair is cut off Based on the true story of the author’s grandmother, this picture book captures the experience of First Nations people in Canada being sent to boarding schools. Under threat of fines and jail time, First Nation parents were forced to give their children up to the government. When Irene is taken to her new home, she tries to never forget her real home, her parents and their way of life. Irene is called only by a number at the school and told to scrub the brown off of her skin. Her hair is cut off. She is punished when she speaks her native language by a nun burning her hands. Irene is eventually allowed to return home for the summer, where she continues to have nightmares of her time at school. Finally, her parents decide to hide the children rather than sending them back. This is not a picture book for preschoolers, rather it is ideal for elementary-aged children closer in age to 8-year-old Irene in the story. The horrific treatment of First Nation children is shown with real clarity. The use of Irene’s own voice to tell the story makes it personal and much more painful. While there is a lot of text on the pages, the book reads well and the text is straightforward and necessary to explain the loss of culture and the darkness of the boarding schools. The illustrations by Newland are almost like painted photographs. They show the family losing their children, the stern nuns, and the punishment scene is carefully captured afterwards in terms of pain and emotion rather than depicting the punishment itself. There is a feeling of constraint and loss in the images of the boarding school and then freedom when the children return home. This book is in a recommended reading list for Aboriginal Resources for young people. I decided that I would read all the books in the list -- for my own interest and simply to take a look at the reading information available to young readers. "I Am Not a Number" is based on the true story of Jenny Kay Dupuis' grandmother, Irene Couchie Dupuis, who along with her brothers was sent to a Residential School in Northern Ontario. This is a powerful picture book revealing the story of so many aborigina This book is in a recommended reading list for Aboriginal Resources for young people. I decided that I would read all the books in the list -- for my own interest and simply to take a look at the reading information available to young readers. This is a powerful picture book revealing the story of so many aboriginal children. This picture book appealed to me more than some of the other books I have read. Young readers are exposed to this sad piece of Canadian history, but also learn about a strong, resilient young girl. Irene carries with her the message from her mother: "Never forget who are are!" Even though the nuns tell her "We don't use names here. All students are known by numbers", Irene remembers her mother's message. With the last Canadian residential school closing in 1996, I AM NOT A NUMBER offers elementary and middle school teachers a sensitive tool for opening a discussion on this recent facet of history. The text, accompanied by the muted brown, yellow, and white tones of the illustrations, reflect the seriousness of the events, without being overbearing. The author and illustrator deal with the material in a gentle matter-of-fact way, enabling younger children to understand and giving older children a With the last Canadian residential school closing in 1996, I AM NOT A NUMBER offers elementary and middle school teachers a sensitive tool for opening a discussion on this recent facet of history. The text, accompanied by the muted brown, yellow, and white tones of the illustrations, reflect the seriousness of the events, without being overbearing. The author and illustrator deal with the material in a gentle matter-of-fact way, enabling younger children to understand and giving older children a point to begin further research. This is a great book to introduce children to the subject of Residential School and the attempt cultural genocide of the First Nations People of Canada. The book is written in a clear, simple language which is clearly understandable. The illustrations are incredibly beautiful and poignant, and help bring the point across. The book is made for younger children, and would make a marvelous read even for a eight year old or a bright seven years old, maybe with parents who could explain them what happe This is a great book to introduce children to the subject of Residential School and the attempt cultural genocide of the First Nations People of Canada. The book is made for younger children, and would make a marvelous read even for a eight year old or a bright seven years old, maybe with parents who could explain them what happened, and why. It is short, and not meant to be exhaustive. It is a stepping stone, a bright flash of light to start to illuminate a dark period. Orange Shirt Day is September 30 in memory of the children who died at the Indian Residential Schools and survived the cultural genocide. In that light, I am immersing myself in stories on this topic. This book tells the story of one survivor out of the 150,000 that attended these horrible places. It is powerful and poignant and worth reading. This is a very tough subject - the Residential Schools that Native American children were forced into - but what a beautiful and touching memoir! There's also a more in depth afterward with more information about the Canadian Residential Schools. This is a must-read for all educators as a stand alone or partner text and a definite recommendation for parents to share with their children. This is another horrific side of American and Canadian histories that is frequently overlooked, and this book provides a way of explaining it to younger children. This book has great illustrations and story. There are so many tragic stories about residential schools. In this one, the parents took a stand and their plan succeeded. I am sure some parents did the same but their child was still taken and they were sent to jail for defending their kids. Very important and sad story of what life was really like in a residential school in Canada for the author's grandmother, Irene Couchie, and how Irene's dad kept her and her brothers from being sent back. The art is lovely, and very empathetic, keeping young Irene at the center of every portrait.